BBC Children in Need provides grants to projects in the UK which focus on children and young people who are disadvantaged. It is local to people in all corners of the UK and supports small and large organisations which empower children and extend their life choices. Every penny from the money you raise or donate will go towards helping disadvantaged children and young people right here in the UK. Children in Need is able to make this promise because it uses investment income and Gift Aid to cover all running costs, meaning that you can be sure your money makes a real difference. "So far you have helped to raise over £600 million and you never cease to amaze us with your fabulous fundraising events and generous donations. However, there are still so many children that need your help. This year's Appeal promises to be bigger and better than ever before so make sure you get involved and help us to make a difference to children who need our help the most, especially in such tough economic times." Doctor Who has often featured as part of the Children in Need evening, including the premier broadcasts of the special episodes The Five Doctors (1983), Dimensions in Time (1993), "Born Again" (2005) and Time Crash (2007), plus a Dead Ringers special (2003) and a number of previews, including the forthcoming Christmas Special whose name is to be revealed tonight. Last year featured a special tea party within the TARDIS, and tonight the Doctor is even losing his clothes for the cause! The BBC One repeat of the Tenth Doctor's swansong, The End of Time Part Two, had an audience of 1.2 million viewers according to unofficial overnight figures. 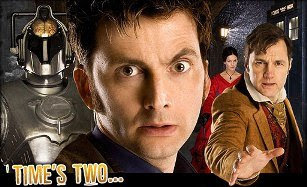 The programme which stars David Tennant as the Tenth Doctor, Bernard Cribbins as Wilfred Mott and Timothy Dalton as Lord President, had a 10.6% share of the audience and was just out-rated by Bargain Hunt on BBC Two. The repeat series concludes today on BBC One at 4.10pm with this year's Christmas Special A Christmas Carol. The BBC One repeat of the 2009 Christmas special, The End of Time Part One, had an audience of 1.4 million viewers according to unofficial overnight figures. The programme which stars David Tennant as the Tenth Doctor, Bernard Cribbins as Wilfred Mott and John Simm as The Master, had a 9.8% share of the audience and was level with Midsomer Murders on ITV1. The repeat series continued today on BBC One with The End of Time Part Two. The BBC One repeat of the 2009 Easter special, Planet of the Dead, had an audience of 1.3 million viewers according to unofficial overnight figures. The programme which stars David Tennant as the Tenth Doctor, Michelle Ryan as Christina and Lee Evans as Malcolm, had a 12.5% share of the audience and won its timeslot. The repeat series continued today on BBC One with The End of Time Part One which, along with the rest of the repeat season, is available on the BBC iPlayer.. The repeat of the 2008 Christmas special, The Next Doctor, had an audience of 1.3 million viewers according to unofficial overnight figures. The programme which stars David Tennant as the tenth Doctor and David Morrissey as Jackson Lake, had a 12.0% share of the audience and won its timeslot. The repeat series continues today on BBC One with Planet of the Dead showing at 1.10pm. The first week in March saw the recording of the French translation of David Tennant's final adventure, The End of Time. The recording took place at the Dubbing Brothers studios in Brussels, Belgium, with dialogue written by François Dubuc, and the session directed by David Macaluso. The role of the Doctor was assumed by David Manet, who has played both the Ninth and Tenth Doctors throughout the series' return. However, the Eleventh Doctor finds a new 'voice' in the form of Belgian stage actor and dubbing artist Marc Weiss. Similarly returning is Franck Dacquin as the Master - he has been John Simm's 'alternative' since Life on Mars. There is currently no information as to when The End of Time (or its predecessor The Waters of Mars) will be broadcast in France. The New Zealand Herald has revealed that The End of Time will air in New Zealand in February. Part One of David Tennant's swansong is scheduled for Sunday 7th February with Part Two following a week later on the 14th. Final figures released by BARB make Doctor Who the most watched programme of Christmas week. The End of Time, Part One had a final rating of 11.57 million on BBC One, much higher than the initial overnight figure reported. This alone makes the programme the 3rd highest rated on British Television for the week. However if figures for those watching on BBC HD are included, as they arguably should be given the programme was simulcast on both channels, then an additional 470,000 viewers are added. This gives the episode had a final figure of 12.04 million viewers for its first showing, pushing the programme into the lead as the most watched programme of Christmas week. This makes the episode one of only two in Doctor Who's long history to have been the most watched programme of the week. It is the 3rd highest rating since the series returned in 2005, only beaten by two previous Christmas specials, Voyage of the Damned and The Next Doctor. It has the 28th highest rating in the series history. Doctor Who was the fifth most watched programme of the year, only being beaten by the Simon Cowell talent programmes. It was the highest rated programme on all of BBC Domestic Television, the first time this has happened. The previous highest place was 2nd for the year for The Voyage of the Damned which lost out to EastEnders. It was the highest rated drama of the year. Another 1.18 million watched the repeat of the programme on BBC Three on Sunday, double the initial overnight figure, with an additional 770,000 watching on the iPlayer during the week. If the ratings for those who watched the programme on any platform during the first week after transmission are added together the total stands at an incredible 15.99 million. Final figures for the second part of the story will be released next week. TV Tonight blog reports that Part One of The End of Time will make its Australian debut on the Australian Broadcasting Corporation on Sunday 14 February 2010 at 7.30pm on ABC1. 'TV Tonight' also reports that Part Two of 'The End of Time' will screen the following Sunday, 21 February 2010, also on ABC1 at 7.30pm. The Sunday afternoon repeat of The End of Time, Part Two, was watched by 1.7 million viewers on BBC One. The programme had a share of 9.6% and an AI of 89. The later BBC Three repeat had 0.28 million and a 1% share. Australia's ABC Television have revealed, via their Facebook page, that they will air the two parts of The End of Time in February. TV By The Numbers reports that the BBC America showing of The End of Time, Part One had a total audience of 904,000 viewers across the episodes three placings. The rating was down on The Waters of Mars which had 1.1 million watching. It was however the most watched programme on BBC America for the week with Doctor Who: Inside Look coming second with 497,000 watching. The cover artwork for the Winter Specials and the Complete Specials DVD Box sets is now available. See the product list on the right for release dates. David Tennant's swansong scored an Appreciation Index figure of 89 on BBC One on Friday. The Appreciation Index, or AI, is a measure of how much the audience enjoyed the programme. A figure of 89 is incredibly high, especially for a programme with such a large audience. The show scored well on all indicators, with viewers marking it as a high-quality programme which they made a special effort to watch. It scored highest with the female audience and with those aged 35-55. The End of Time - Part Two is the highest scoring of the five specials. Only the last two episodes of Series Four have scored higher on their first transmission. Earlier in the day, the repeat of The End of Time - Part One, with its lower audience of 2 million, scored an AI figure of 90. 10.4 million people watched the final part of The End of Time on BBC One yesterday, according to unofficial overnight figures. The programme got a 35.5% share of the total television audience and was the second most watched programme of the day. EastEnders once more took the top place with 11.6 million, the programme benefiting from the Doctor Who inheritance. The later showing of Coronation Street on ITV1 had 9.8 million viewers while its earlier placing got 8.6 million, with Doctor Who beating the soap in the period they were head to head. Doctor Who peaked with 10.87 million watching between 7:45 and 7:50pm. The rating makes the Tenth Doctor's regeneration the most watched regeration in the series' history. Doctor Who was also available on BBC HD where a further 389,000 watched the episode. On BBC Three Doctor Who Confidential had 1.1 million watching with and additional 76,000 on BBC HD, one of the highest ratings for the series and the second highest multi-channel programme for the day. 2 million viewers watched the lunchtime BBC One repeat of The End of Time Part One, where the programme comfortably won its timeslot. BBC News has published a report on the overnight ratings for the episode, also covering some of the critical and audience reaction to Tennant's departure. The passing of the Tenth Doctor is covered extensively in Saturday's papers. Beware reviews do contain spoilers of the episodes. The Times has a minute by minute description of the story which it says is a great entrance and a great exit and has a look forward to the Moffat years while The Mail has a big photo feature on the episode. The Guardian describes the outgoing production team as masters. The Sun claims there was a huge electricity surge in the UK as the population switched on their kettles as the episode finished although The National Grid's website appears to contradict this. The paper's reviewer hated the episode calling it an embarrassing spectacle of overacting. The Herald thought the story was funny and sad, scary and uplifting, threatening and comforting while The Telegraph felt that David Tennant said farewell to the series in thrilling yet emotional style. Online, Den of Geek says the episode was an 80 minute exercise in just how much David Tennant is going to be missed and Airlock Alpha says the real heart of the episode was the interaction between Bernard Cribbins and Tennant, with both actors able to turn even the smallest piece of dialogue into something spectacular. SFX gives the episode five stars calling it a great finale with very clever writing, and incredibly sad yet resonant final words. Matt Smith's local paper The Northampton Chronicle says the new Doctor will make the town proud. The episode commentary, the last with Russell T Davies and Julie Gardner, is now on the BBC website. For more press items in the last few days see GallifreyBase's Media Summary. BBC News have uploaded this morning's interview with David Tennant. The item contains two clips from The End of Time Part Two, which contain spoilers from Part One. Tennant later appeared on a BBC Radio 5 Live phono-in, which is available on the BBC iPlayer. BBC News have also published an article on regenerations past and present. David Tennant has also talked to MTV about his 'Doctor Who' Mementoes.